New Master’s of Science with focus on Executive Leadership to begin Fall 2019! Nurse executives require sound clinical knowledge and administrative skills to function effectively as leaders within today’s integrated healthcare delivery systems. The executive nurse leadership track in our MSN program is offered in conjunction with the Department of Health Administration and Human Resources. This track prepares nurse executives to be leaders in the increasingly complex and rapidly changing healthcare climate. The curriculum emphasizes content in organizational and financial management perspectives, as well as the knowledge and skills to exert a leadership role in health care and contribute to the art and science of nursing. The executive nurse leadership track is a 30-credit Master of Science in Nursing degree program for baccalaureate-prepared nurses. Students are admitted in the fall or spring semester. The program can be completed in 2 years and is offered in a hybrid format, with some courses on line and some on campus. This summer, I had the opportunity to intern at Memorial Sloan Kettering Cancer Center, in their clinical assistant program (CAP). I worked on the colorectal unit for 9 weeks under the instruction of my preceptor. Words cannot describe just how much I learned throughout my time at MSK; it far exceeded any expectation that I had for the program. 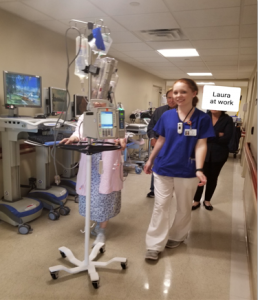 The guidance that my instructor showed me throughout every single 12-hour shift was exemplary, and the nurses on the floor were very welcoming. The staff knew I was eager to learn, and so they would pull me aside if there was something interesting to see or do. The CAP program allowed me to shadow one nurse and see how he executed the tasks of the day. I got to learn how my preceptor organized his patient assignments, assessed patients, timed administration of medication, prepped patients for procedures and gave hand off to the next shift nurse. Being on a colorectal unit, I had patients with all kinds of cancers and tumors of the GI tract. It was a really amazing tie in that all the diagnoses, surgeries, treatment modalities, tubes and drains I was observing, I had just learned about in the GI med-surg lecture this past spring. Therefore, it was amazing to take what I leaned in the classroom and witness/apply it in practice! Even though it was a colorectal floor, I got nursing experience with many other diseases and cancers as well, from lung cancer and breast cancer, to bladder cancer and melanoma. I had the pleasure of taking care of patients who were here for a prophylactic surgery due to a genetic predisposition of a disease, all the way to end of life and hospice care of patients. I learned SO much from my patients and their families. I laughed as they told me stories, I smiled as they showed me pictures of their children or grandchildren, I cried many happy tears and many sad tears. These individuals were here to be taken care of in the most vulnerable time; however, these patients meant more than their diagnoses. They had children at home, jobs they had to take time off from, and lives that were impacted in far more ways than I can ever imagine. So, when patients asked me if I could come back in to take care of them, it was an indescribable and rewarding feeling. I had a patient’s wife tell me that she finally felt comfortable enough to leave her husband at the hospital and run home to finally catch some sleep. I was so honored that these individuals allowed me to come into their life and help them in their time of need. One of the best feelings is making someone smile on their hardest days. Sometimes it is the little things like listening to what they have to say, that makes all the difference. Throughout the program, I gained experience with patient interactions, establishing rapport, patient education, nonpharmacological interventions, and many post op considerations. I learned about so many amazing surgeries and procedures that could performed, and new research that is being done. I gained experience with skills such as medication administration, colostomy care, pleurX drains, ileal conduits, PICC lines, mediports, chemotherapy and infection risks. I also learned about psychosocial concerns, ethical concerns, cultural considerations, interprofessional communication, teamwork and collaboration. Above all, I learned what it means to be empathetic. It was so neat to take the skills that I learned here at the university and build upon them in a hospital setting! My experience at MSK was such an amazing hands-on opportunity, and I know that I will take what I learned there and apply wherever I go. I learned what it means to be a nurse and how vital a nurse’s role is in patient care. My internship was an experience that I will never forget! Meet Alexa, one of our Juniors who is back from her study abroad in Ireland! 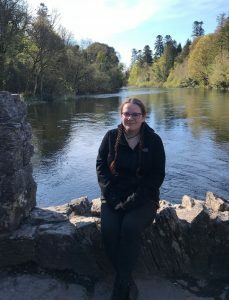 Hi I’m Alexa Kane, I’m a junior nursing student and I just finished a semester abroad in Galway, Ireland. 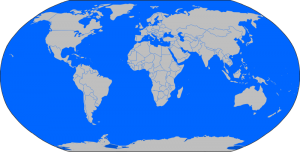 I lived there for 4 months and studied at the National University of Ireland, Galway. Galway is a gorgeous city that is full of so much history and beautiful architecture. Some of the remaining medieval castles that once held lords are now coffee shops and parts of the shopping center. Everywhere in the city there are buskers (performers) singing and playing music and people walking along on the cobble stone streets. Ireland is truly a magical place. The scenery is beyond amazing. One of the most remarkable days I had in Ireland I spent in the tiny town of Cong, which is where the film The Quiet Man was filmed. We hiked and played games in the shadow of the ruins Cong Abbey. This place felt like a completely different world, like magic walk through the woods. Ireland as a whole feels magical with it all its hidden gems of medieval castles, churches and gorgeous landscapes. It was so surreal to be in Ireland for a semester. I met some amazing people while I was there and did things that I had never thought I would do in my entire life. I got to travel to Brussels, Amsterdam and London. The extra workload in the fall of sophomore year was so worth it because this experience is one I will never forget. It truly changed me and made me more independent and aware of my impact on others. It is incredible that nursing students at the University of Scranton are able to study abroad for a full semester. This really was a wonderful experience that everyone should take advantage of if they can! The labs are set up, the computers are connected, the copier is running…the third floor of McGurrin Hall is “waking up” after a bit of down time for the summer. We are ready to welcome our new Royals Class of 2024, and welcome back to our returning Royals. Faculty and staff have been busy finishing up preparations for the new academic year. What are you looking most forward to as you head “back to school”? For us, it is definitely seeing our students and hearing about their summer adventures: traveling, externships or some much-needed downtime… Enjoy the rest of your summer Royals- hope you are resting up…it’s going to be another great year! Congrats to our 2018 class of Royal RNs! 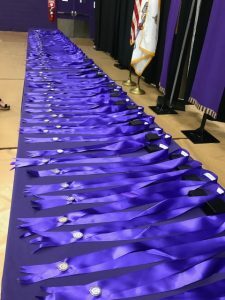 Yesterday we celebrated our nursing graduates as they received their pins. We wish them the best of luck with their upcoming NCLEX exam and look forward to seeing all of their professional accomplishments. Welcome to the alumni family of Royal RNs! We recently welcomed back over 20 alumni members of the Class of 2017 to participate in the “Alumni Panel” to speak about their experiences as new graduates. 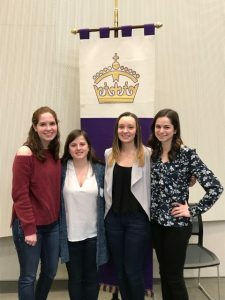 Each year, Dr. Lovecchio coordinates the Senior Professional Day that helps prepare the senior class for their job hunts and their first year as professional Royal RNs. The panel this year is employed in very diverse group of specialties including NICU, Cardiac ICU, Medical/Surgical, Pediatrics, Women’s Health and Emergency nursing. The Alumni gave practical advice and some honest reflections on their experiences taking their licensing exam and adjusting to their current roles. They also spoke about the difference a Jesuit education made in their nursing practice. The Alumni Panel is always the most popular part of the day and the seniors appreciated being able to speak with and network with our graduates. Who’s ready for the start of Spring semester? For some, Intercession at the University means relaxing and unwinding. For our RoyalRNs, it means travel, service and learning. Safe Travels to our students and faculty as they travel to the Dominican Republic, Uganda, Ireland, New Jersey and locally around North East PA. Some students will learn about public policy, others will collaborate with agencies and health professionals to provide care and compassion. 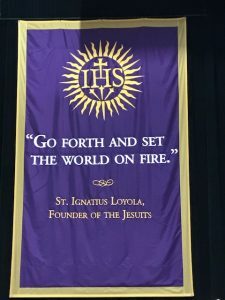 All of them will see the benefits of their Jesuit education and will see the University’s strategic plan of becoming Engaged-Integrated and Global in action! 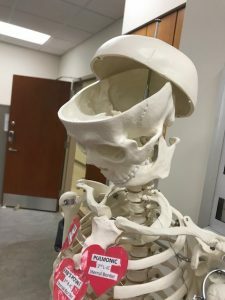 Nursing Getting into the Spirit! Our last faculty and staff meeting of 2018 brought some food, sweets and games. Being all together is rare as we are often in many different directions in the community, in clinical and in the classroom. 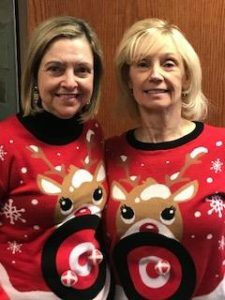 Congrats to Dr. Hudacek and Dr. Culp who were the winners in the ugly sweater contest. Not only were they winners, they were twins…great minds really do think alike! Best wishes for all for a restful and peaceful holiday season. Here’s to a great break- and we will see you in 2018!